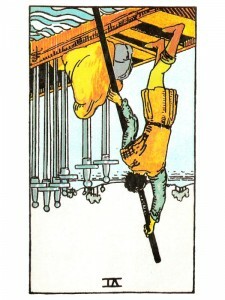 Six of Swords (R) says you are experiencing information overload. Clear your mind and put your thoughts in order. In a situation where there has been mental or physical abuse – you need distance and support so that you can gain a new perspective. With distance it is possible to rise above the situation so that you can see the larger pattern, determine some meaning behind it and what actions are necessary. There are times when it is proper to leave others behind, in order to break through relationship patterns that obsess and bind you. When you feel locked into a difficult set of circumstances – nothing can be accomplished – center yourself and wait. Difficult though your life may be – it will change. Go deep within yourself and seek spiritual guidance. Think carefully now and ask yourself if you have considered everything. Communicate any new ideas or decisions in such an objective way that they can be received and heard. Focus your mind and allow yourself to see the whole picture. When your balance and peace are disturbed – your passage is no longer serene – your emotions are stirred up and your physical or spiritual journey becomes stormy. Trying to “attack” a long standing problem – especially one that has been accepted by others – only agitates the situation. Unsatisfying or oppressive situations can go quietly along for years until someone decides to do something about it. Trying to remove the swords from the boat will sink it – they are plugging up the holes. When “swords” symbolize unhappy memories where “silence” has become the defense, communication will be painful – but it will also begin the healing process. What immediate problems are you attempting to solve? Where will you go to solve them? Where in your life right now is mental clarity important? How are you liberating your mind from clutter and false ideas so that you can think clearly? When you step back from your problem to gain a clear perspective, what do you see? Any Ten before or after: Important decision regarding a move – a possible trip or new residence. Next to Moon or High Priestess: You do not have the full picture yet – wait a little longer before making any changes. Next to Wheel of Fortune: Do not take any unnecessary risks now – expect a change in financial affairs, the benefits are coming and you must be patient now. In the first position: The mental demands made upon you may be great, but nothing so great as to interfere with completion of your karmic purpose. Just the opposite, all difficulties will support your purpose. In the second position: Your ability to charm with your mind may come up short in the Physical Plane or you may be too effective for your own good at times. In the third position: If you have been avoiding or diverting duties that rightfully fall to you, you should act quickly and decisively to put things in order. In the fourth position: A personal life with personal romance and delicious moments of privacy may suffer under the extreme distortions present in this archetype. In the fifth position: You may know that you will in turn be left behind if you leave the wrong things or wrong people behind now and yet you procrastinate. In the sixth position: Either there will be virtually no effects or the effects will be great and require much of your attention. In the seventh position: On the one extreme, there will be fear of others with similar, yet different ideas than yours. On the other extreme, there will be a strong urge to run roughshod over the similar, yet different ideas of your comrades. In the eighth position: Perhaps the above changes are necessary, even planned, but somehow blocked at this time. In the ninth position: While duty may have been observed and obligations met, you may not have reached the magic point where your heart has chosen them of its own volition. In the tenth position: Even God’s grace can taste like a mother’s dose of medicine given for your own good. How this medicine tastes is up to you.